I spent several hours going through all of my fabric, and got rid of a lot of stuff that have been languishing in the dresser for years. Much of it I had picked up at thrift stores and yard sales. I went through this period several years ago when I was making a lot of bags and I was crazy for vintage upholstery type fabrics. Then there are all the remnants leftover from garments I've made, you know, you have almost a yard left and so you feel like you should hang on to it because you might be able to use it for trim, pocket linings, etc. 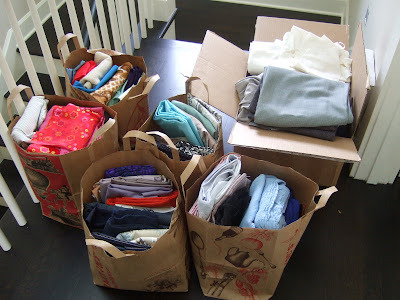 I kept a few of the larger yardages to use as muslins, and ended up with 5 bags and 1 box of fabric to get rid of (oh my). I took a few pictures, posted an ad on Craigslist for "free fabric", and went back to organzing my work area. Within 30 minutes I had 5 phones calls and 4 emails from people who wanted the fabric. (Is there some kind of utility that will alert you when certain keywords are posted on CL? Must look into that.) Two hours later, it was out of my house. This is what's left. I'm still deciding how to store it. 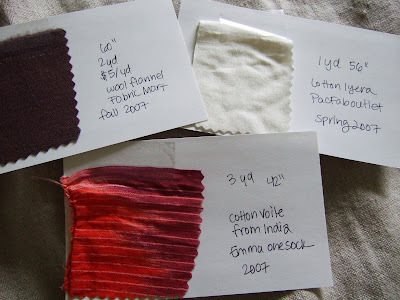 Fabrics that I kept were swatched and attached to index cards. I noted the measurements and as much information as I could remember: fiber, date purchased, source and price. I am soooo happy I did this. Knowing what is in your fabric stash is a good feeling! Well maybe that's what I should do also - Craigslist quite a few regular pieces I no longer want and all those 1/2 yard scraps that I've been holding onto! Do all your fabrics now fit into that little pink box? If so, that's amazing, you should write an article about how to effectively get rid of stuff. I remember your last closet purging and it seemed to be just as thorough. I admire you for cleaning out your stash. Maybe you could come clean mine out for me and I'll just hide my eyes. Too much stash makes me a little uptight and the cluttery makes me batty. I need to do some deep cleaning again. Good to know Craig's List is a good way to get rid of excess fabric. I also like how you put what you have on index cards - smart. Wow, what a great idea for organizing your fabric. Thanks for the ideas! Thanks for the great idea on the index cards. I hadn't thought of that. I love the little pink box file organizer. You did quite an amazing job, I'm impressed! The pink fabric file is a great idea. I don't have nearly as much fabric as you have. But that organizer is just what I would use if I did. I love seeing all your BWOF creations - you make some wonderful things! Loving reading your blog. 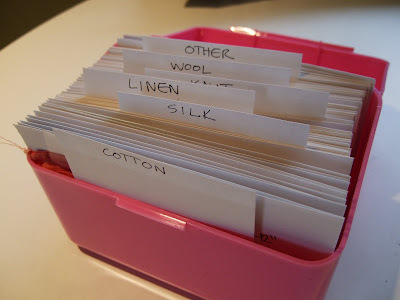 Anyway about the card file, why not punch a hole in the index cards, thread them on a big metal ring and that way you can carry them with you to the fabric store. You can check it when buying fabric or patterns. oooo!!! Love your organization for the stash!!! My big 4 patterns are all organized but my stash is a mess. Thanks for sharing this... do u know a good way to organize BWOF and other mags??? Wow! I wish I'd known you were going to unload tons of fabric. Actually, scratch that...I'm trying to figure out my stash situation as well as I'm about to lose some sewing/storage space. Will have to see if I can muster up the energy next weekend to do a similar stash reorganization. Your note card idea is brilliant! That must feel so good. I felt much better after I unloaded a bunch of yarn. And I still need to do that with my clothes. And the index cards, what a great idea! I need to catalogue my stash too! I have an RSS feed on craigslist for 'sewing'. My eternal hunt for a cheap featherweight (Of which I've found two for under $100 but always email and tell them they could get between 200 and 300). I like your fabric file. Must try that. I need to clean out my stash too, but, I don't have the strength. I'm going to go the route of sewing it down in three to six month jags. Your index card idea is brilliant! I also have been organizing my stash during the weekend, taking out the fabrics I can use for spring and summer! Wow! i'm totally impressed (and inspired) by your index card idea. thanks! 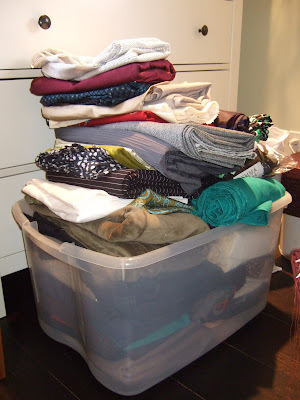 I did that last Spring, and indexed all my winter wools - of which I've used very few, and got rid of 50 lbs of fabric. I weighed it! I used Freecycle here - along with about 75 patterns. Worked well. You're cleaner than I am though, judging by the size of your box. Doesn't it just feel good? I've been internetless for a while, but I'm glad to see that you've been busy! I am super impressed with your index file, and I've jotted down a couple of the patterns that you have made/have your eye on! So nice of you!! Too bad I don't live in the area! I've been on a spring cleaning kick myself. I've only touched the tip of the iceberg of my fabric stash. I've just reorganized a little bit according to type of fabric. Your indexing system is amazing. Great idea for ridding unwanted fabrics. Also I luvvv the idea of attaching swatches to index cards... I know what I'll be doing tomorrow. Thanks for idea.